Blair is editing on the set of a commercial shoot. This is common for her and is very helpful for production! Blair is displaying one of the many batting practice ball she's caught. 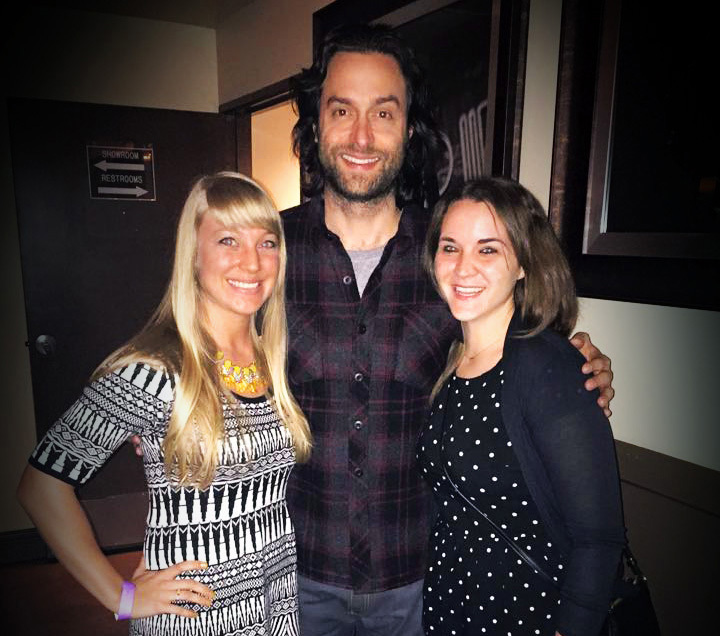 Blair posing with her friend, Kelsey, and comedian Chris D'elia. Blair originally wanted to be a high school math teacher and coach, but that all changed when she learned the art of editing. Blair is a hard worker who always has a fun, positive attitude. Her roles include, but are not limited, to editing, script super, timing and taking shot notes on set, organizing footage and creating a starting point for senior editors, and giving the office dogs love and attention. Blair wants to do it all; commercials, music videos, documentaries, short films. She enjoys editing all of these categories and would love to create any of these for a living. If she could, she would also like to cut together sizzle reels for athletic events and standup comedy specials. A dream job of hers would be to edit videos for the Kansas City Royals. She was born in Austin, Texas, but is a huge Nebraska Husker fan due to the fact that her Dad's side of the family is from Lincoln. She's also #RaisedRoyal and #ForeverRoyal. The K is her second home. Comedy is her thing. She has seen tons of live standup performances including some of her favorites: Daniel Tosh, Kevin Hart, Chris D'elia, Aziz Ansari, John Mulaney, Bo Burnham, John Caparulo, T.J. Miller, and Jeff Dye. Blair is all about having fun and is always down to go to a baseball game, comedy show, theme park, goat yoga (yes, that's a real thing), ziplining, fishing, etc. Blair's favorite color is yellow. She loves sunsets. Sunrises are pretty cool, too. Her favorite shows are: The Office, Modern Family, Tosh.0, The Middle, America's Next Top Model, and Always Sunny in Philadelphia. Blair received scholarships to play softball at Garden City Community College (Kan.) and Missouri Western State University where she finished out her athletic and academic career. She currently edits bomb videos during the day and is a KC Crew connoisseur by night, playing slowpitch softball, indoor/sand volleyball, pickleball, ping pong, tennis, and kickball leagues. In other words, if you need sub, see Contact page.